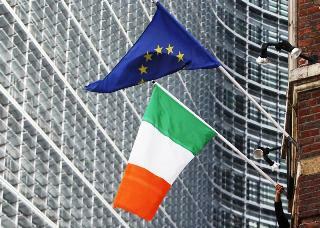 A man adjusts an Irish flag as it flies next to a European Union flag near the EU Commission headquarters in Brussels. Euro zone leaders pledged on June 28 and 29 to review the terms of Ireland’s bank bailout, as part of a broad attempt to break the “vicious circle between banks and sovereigns”. Irish 10-year bond yields fell approximately 80 basis points to 6.3 percent, between the announcement on June 29 and midday July 4. Patrick Honohan, governor of the central bank of Ireland hinted that the euro zone summit could pave the way for a prompt restructuring of the Irish Bank Resolution Corporation, a bad bank that houses the former Anglo Irish Bank.